For me, photography is an expression of exploring the world I live in. I moved from Texas to California in my late 20's and began wandering through the great western landscapes at the same time my passion for photography was developing. These two budding passions--exploring and photography--became inextricably linked. I often return to places I've been to before, while seeking new areas to probe, and am fascinated how the landscape changes from season to season, and year to year. My goal in photographing nature is to not merely reproduce a scene, but to interpret it--showing something unseen by my eye, but clearly visible to my imagination. The final interpretation is up to the imaginations of those that view the images. I still prefer to work in traditional "film" photography, and most often in the Black & White medium, using large and medium format cameras. I do occasionally capture digital images, or use color transparency film, and then make digital prints. Each image on this website includes a description of how the image was captured and how the print is produced. All purchased prints come with a certificate that includes some technical data about the print, and information about how and when the image was made. noticeable degradation. 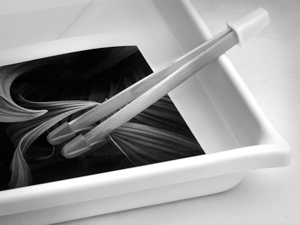 This traditional process has been used to create photographic art for over a century. Digital Prints are produced with pigment based inks on exhibition quality papers and have a very long life, which better papers and printing technologies are extending every day. Current estimates are that quality digital prints made on exhibition quality papers which resist moisture absorption can last well over 30 years without any image degradation. Both types of prints are dry mounted on 100% cotton rag, museum quality mount boards. All prints should be properly framed with archival (acid free) materials, and displayed out of direct sunlight. This is the same recommendation made for paintings and other works of art, whose pigments and materials degrade faster in direct sunlight. If you would prefer loose prints (not mounted), please highlight that request when you place an order. Unmounted prints are considered a special order and only produced on request, so they may take longer to ship than a standard mounted print.